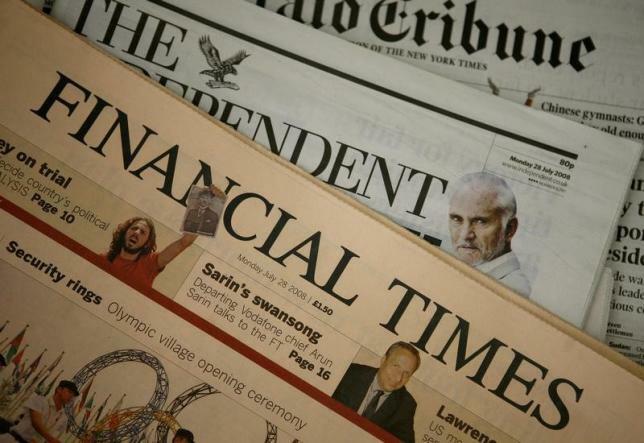 LONDON – Japanese media group Nikkei has agreed to buy the Financial Times from Britain’s Pearson (PSON.L) for $1.3 billion, putting one of the world’s premier business newspapers in the hands of a company influential at home but little known outside Japan. The deal, struck after Nikkei beat Germany’s Axel Springer (SPRGn.DE) to the prize, marks the biggest acquisition by a Japanese media organization and is a coup for the employee-owned firm which lends its name to the main Japanese stock market index. In the Financial Times it has acquired an authoritative global newspaper that commands strong loyalty from its readers and has coped better than others with the shift to online publishing. It was one of the first newspapers to successfully charge for access to its website. Established in 1884 and first printed on pink paper in 1893 to stand out from rivals, the FT has employed some of the leading figures in media and politics, including Robert Thomson, Chief Executive of News Corp (NWSA.O), former British finance minister Nigel Lawson and Ed Balls, an adviser to former British prime minister Gordon Brown. The Nikkei newspaper, which has a circulation surpassing 3 million for its morning edition alone, enjoys a must-read reputation for financial and business news in Japan but has struggled to break out of its home market. The paper, with its deep ties to corporate Japan, has also faced criticism for running earnings “previews”, which are considered to be leaks, days ahead of corporate results at a time when Prime Minister Shinzo Abe’s government has been pushing for greater corporate transparency. As the news broke of the Nikkei deal, an FT journalist tweeted a photograph showing staff in their newsroom crowded around a television watching the developments. According to tweets from journalists who were addressed by the paper’s management, FT Editor Lionel Barber told staff the deal “was not and is not a shotgun marriage”, saying there had been hours of conversation. Reporters at the paper told Reuters there was some apprehension, as they knew very little about their new owner, but there was also relief they had not been bought by Bloomberg – another potential buyer – which could have resulted in duplication of staff roles and more potential job cuts. Chief Executive John Fallon told reporters he believed that like Pearson, the new owner had a commitment to the “fairness and accuracy of its reporting, and to the integrity and independence of its journalism”. Reuters was first to report on Thursday that the 171-year-old Pearson had finally decided to sell the business daily as it expanded more into education, sparking speculation as to who was the buyer. The name of Nikkei came out of the blue. The FT itself reported that Axel Springer, publisher of Germany’s Bild and Die Welt newspapers, was the most likely buyer. “We were all frantically Googling Axel Springer to find out who they were… and everybody was showing off their great German skills. That obviously changed quite quickly,” said one person familiar with the FT newsroom. Analysts and bankers had for years been waiting for Pearson to sell the trophy asset, although the names most closely linked with a deal were financial data terminal providers Bloomberg and Thomson Reuters (TRI.N), parent of Reuters news agency. A person familiar with the situation had told Reuters in recent weeks that Axel Springer was working on a buyout, and a spokeswoman confirmed that the group had held talks about a deal. The sale of the FT Group is expected to close during the fourth quarter of 2015 and does not include its 50 percent stake in The Economist magazine or the London headquarters of the newspaper on the banks of the River Thames. “It is hard to argue with the price,” said Richard Marwood, senior fund manager at AXA Investment Managers, a shareholder in Pearson. Barclays said the price represented a multiple of 35 times earnings before interest, tax and appreciation. Pearson, founded in 1844 as a small building firm in Yorkshire, northern England, was once one of the world’s largest building contractors and has had a long list of varied interests from banking and publishing to owning theme parks and Madame Tussaud’s waxworks.